May 2016 - ID Studios, Inc.
Lamin-Art loved how Lytx turned out almost as much as Lytx did themselves. To feature the use of their laminates, they interviewed Associate and Sr. Designer for the project, Jill Russell. Lytx is a driver risk management company located in San Diego, California that creates safety-monitoring programs for 1,300 fleets across all major industries. In business since 1998, Lytx formerly operated under the name DriveCam; however, as their product offerings evolved, so did the company, necessitating a re-branding to bring their name, logo and corporate office design more in-line with their position as a trusted provider of cutting edge analytic software that makes drivers and roadways safer every day. Before sitting down to design, ID Studios conducted an extensive visioning process to zero in on aspects of the company’s culture that could be integrated into the overall design. 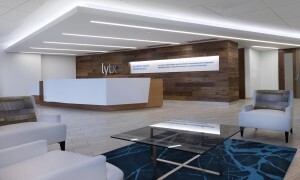 They found there were two central components defining Lytx: an established history of professionalism and trust within the industry combined with dynamic and forward-thinking creativity. ID Studios then set to work creating an interior design that combined these two elements into a cohesive whole. 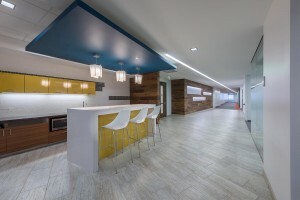 While ID Studios used wood and stone throughout the design of Lytx corporate headquarters, they determined that laminate was the ideal solution for high-traffic areas such as cafés and break rooms. Lamin-Art provided an outstanding product for this use. Laminart laminate used on the high-use cabinets in the coffee bar area transitioned seamlessly from the natural ones. Thanks to great feedback from both clients and contractors, ID Studios is enthusiastic about using Lamin-Art products again in their future projects. See more of the project on ID Studios Website. Design Team: Deborah Elliott, Principal; Jill Russell, Associate, Senior Designer; Steven Davis, Associate Principal, Project Manager; Lesley Christensen, Designer. Specialty: Specializing in workplace design and strategic planning. ID Studios believes forward-thinking design strategies have the power to transform the way in which people work, learn and communicate with one another.